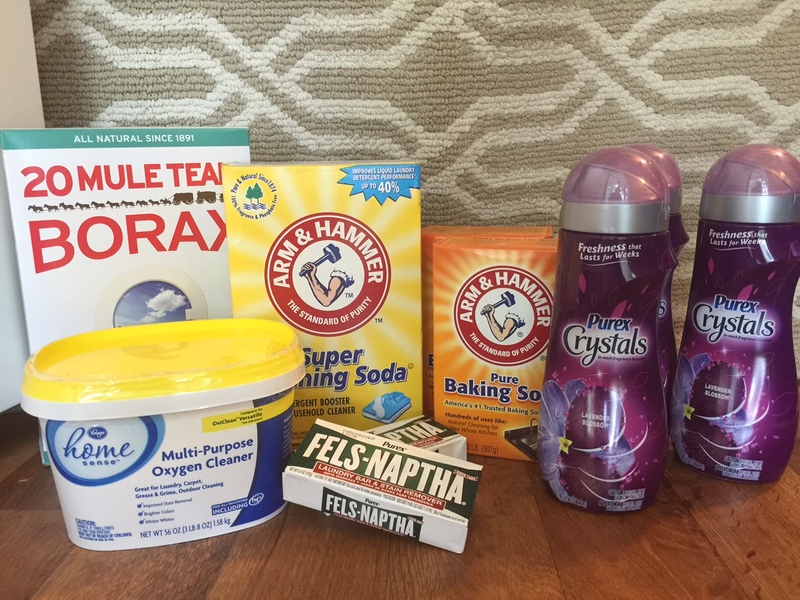 I was so excited to make/try this homemade laundry detergent! We normally always use Tide liquid detergent that runs us about $20 a bottle lasting around 90 loads. With it just being just my husband and I, we do about 4 loads of laundry a week. With doing 4 loads a week and using the recommended amount of soap that would mean we would use 2 bottles a year or $40 a year. We have almost been married a year now and we just finished our 3rd bottle of Tide. Sometimes we do more laundry a week or use a bit more. So the past year that has costed us $60. 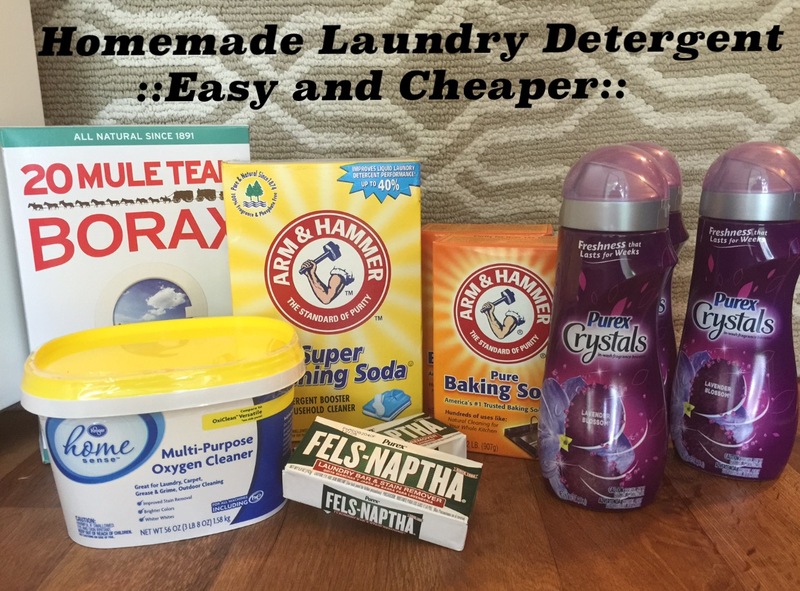 This homemade laundry detergent costed us $29.80 for all the ingredient needed at Kroger. For that price it will make enough detergent for 312 loads of laundry and will last us close to a year and a half! Wow!! What a huge savings! For a year and a half of Tide that will run us $120 and for a year and half worth of homemade laundry detergent it will only cost us $29.80!! That is 1/4 of the price of Tide! Before I decided to make this laundry detergent I was a little worried whether or not it was HE washer safe. If you do not know what HE means I will explain it for you. HE simple means High Efficiency. In order for a washer to be an HE washer it must use 50-70% less water, electricity, and detergent than a regular washer. Which cuts down on the cost on your electricity and water bills. Because an HE washer uses less water it needs less soap as well. HE detergent produces less suds than regular detergent. If you use a NON-HE detergent in an HE washer it will negatively affect your washer. It can create more moisture leading to mold in the washer and create a smell that is not pleasant. With that being my biggest concern I made sure it was HE safe! And it is!! 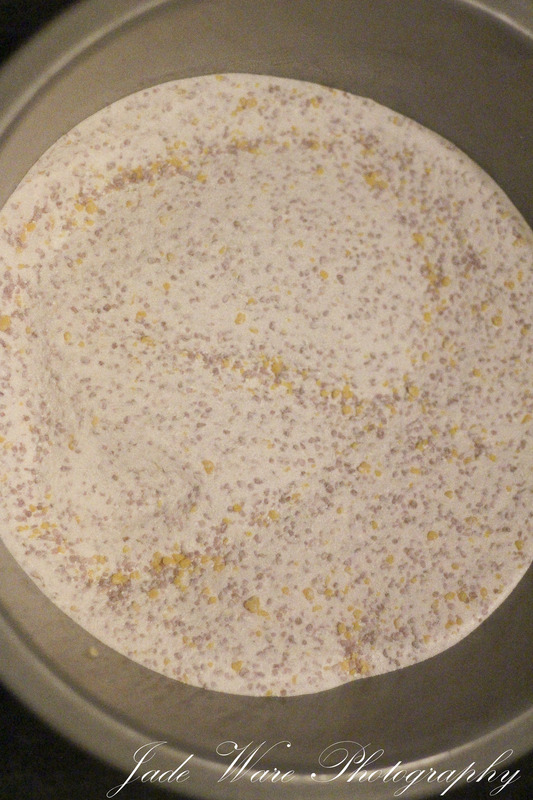 Also, another concern was will it all dissolve in the washer….And after using it several times I can say YES it all dissolves! Below is the receipt with all the ingredients needed to make this detergent. You can see how cheap it really is! It may be a lot to buy at one time but in the long run it will save you a lot of money! If your weekly budget will not allow you to get all the ingredients at one time, I recommend getting one or two every time you go to the grocery. That might make it a little easier on your wallet. 2 boxes of Arm & Hammer Baking Soda (4 lb total) ***You may be able to find a big box containing 4 pounds in it but at Kroger they only had 2 pound boxes of it so I got 2. 1 Container of Oxyclean (3lb) ***I bought the Kroger brand of Oxyclean as you can see in the picture above. It was much cheaper and is the exact same thing. 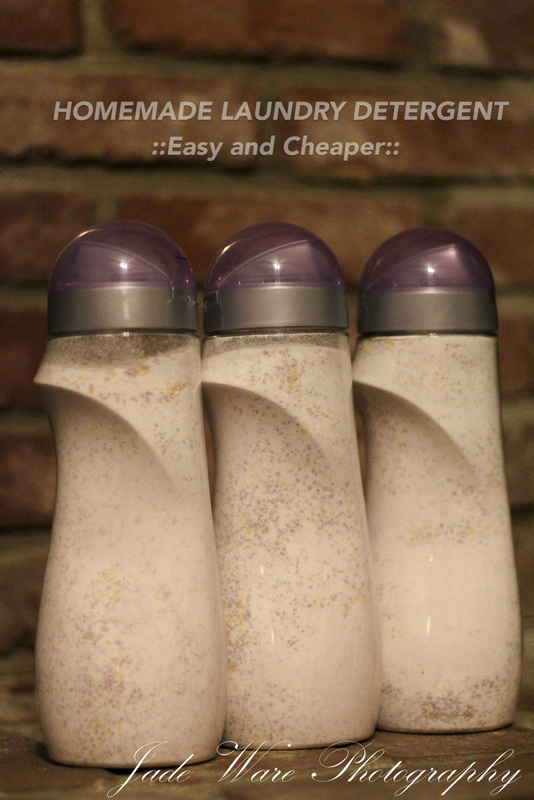 3 bottles of Purex Crystals Fabric Softener (55 oz) ***You may be able to find larger bottle of this but at Kroger they only had the smaller ones which is why I had to buy 3 bottles. First things first. I opened my bars of soap up the day before I decided to make it and let them sit out to dry it out a little bit before I used it. The hardest part about making this is grading the soap. There are several options in which you can do this. The first thing I tried was to use a cheese grader but that took way too long. If you have a larger grader that may work better for you. Then I tried the food processor. I cut the cheese very carefully into 5 small blocks and then cut each block into little pieces. Then I places about 1/5 of the bar of soap in the processor and ran it until the soap was as small as I could get it. Doing it this way makes mini balls of soap. Using a grader will get your soap a lot finer, but that option didn’t work out for me. Another way you can do this would be to cut the soap into 5 slices and place on a plate and put it in the microwaves for about 1 minute. It will get really big (but don’t worry). You will then let it cool off and it will just crumble into pieces. If I had to do it over again I would start out trying the microwave method! ***If you decide to make this let me know which method you chose and how it worked for you! After the soap is graded/crumbled the next part is easy! All you have to do it mix it all together. I used a large bucket we had at home and mixed it in sections. I poured a little bit of everything in then mixed it up and repeated that process until I used all of the products. Did this 4-5 times. After emptying the Purex Crystals I kept the bottles and tore of the labels and fill up each bottle with the detergent. This makes it easy to use while doing laundry. The neat thing is the caps on the bottles are measuring cups. I got out a sharper and on the outside of the cap I marked the line that was at 2 tablespoons. YUP, that’s all you need is 2 tablespoons per load!! The rest of the detergent I left in the bucket for now with saran wrap on top. I will eventually buy a sealed container to put it all it.
.:The finished products in the Purex bottles:. If you decide to make this let me know how it works for you!